The Edmonton & District Quilt Guild has about 300 members. This year is our 30th Anniversary, so the show was larger than usual. I didn't take many photos, but thought I'd share a few with you. This first one is a Chinese mask, three-dimensional and heavily embellished. 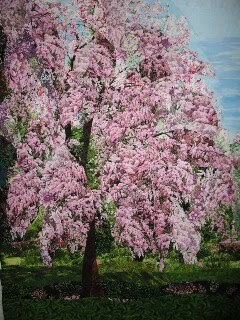 It is about 16" across, made by Wanda Cracknell. 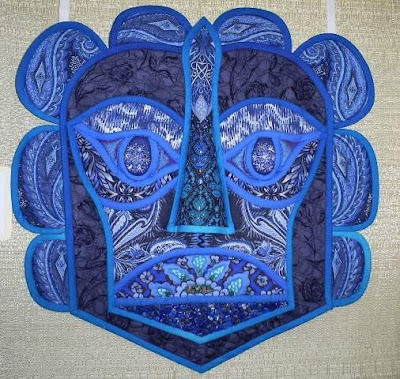 If I had an idol in the quilting world, it would be this highly imaginative woman. The other one is about 24 - 30" square, quilted by domestic machine. The crosshatch in the middle has lines about 1/4" apart. There are no flaws in this quilt. It is perfect... and totally intimidating. 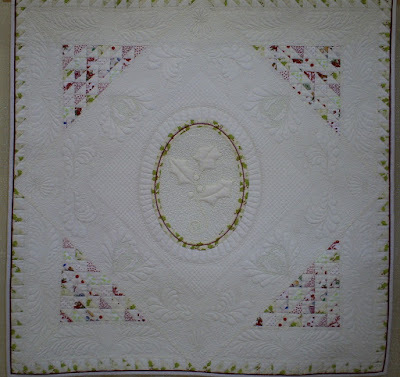 I had the quiltmaker's name but cannot find it. Be sure to examine her feathers... she has holly leaves in them! And this is what I'm working on today. I made this as one of those mystery quilts that required using up stash, so combined a couple of unlikely fabrics. In case you cannot see them, I am quilting leaves all over it, from 1/2" to about 1 1/2" long. This is my "practice controlling that machine" quilt because the next one is more important to me, and my chosen design will take some control. It is hot and dry here. We need rain! I'm glad for AC this weekend, and cannot believe that we had snow last Saturday. I LOVE that mask! I have never heard of the quilter but will be googling her name to see what else she does. What an incredible Chinese mask! It's just fabulous! I just reread the post, I had another Wanda in mind, sorry for the confusion. I sent you a previous email. The mask is pretty neat but that little quilt is very impressive. To be able to dream that up and then quilt it. So tiny. Beautiful. Oh goodness, you had SNOW last week? Sounds as if you are enjoying your long arm. I like the idea of using up scraps! The quilt you have on the frame looks so comfortable, like one that will be appreciated by the person receiving it. Elsie, Wow you have some amazing pieces on display. That blue mask is incredible. And I really like the one with the holly leaves in the centre. Very elegant. I love your Tall Mountains pic in the sidebar!